Kenny plays the 5 string banjo and provides the high tenor vocals. 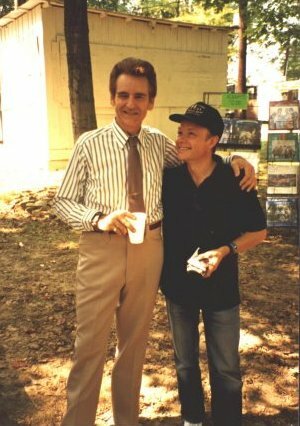 Kenny is shown here with Del McCoury at BeanBlossom. Kennys banjo is a Gibson copy specialy built for him by Bill Sullivan of First Quality Music. Pete built the Music Shed that we practice in (actually its more than a shed, there are families of 10 in the fens with less room). Pete's friend Dennis of Grunty Fen sometimes appears at our gigs to the consternation of the audience. 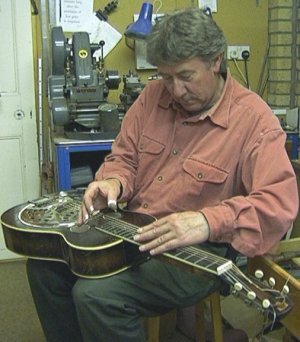 Pete is shown here trying out his 1930 Dobro after Mike Nelson had fitted a new cone to it. John plays rhythm guitar and sings the lead vocals. Our revered leader and main culprit, John did the drawing of Dennis of Grunty Fen, painted our band name on the teapot, and designed the peghead inlay on my new mandolin. John is the only member of the band with an unbroken membership. I haven't got a picture of john so a picture of the inlayed peg head will have to do for the present. Mike made the F5 copy mandolin seen here during 1997 and is working hard on the playing to justify it. Mike is often called on to pour the tea at band practices and can decimate a packet of chocolate hobnobs in less time than it takes to play Rawhide. 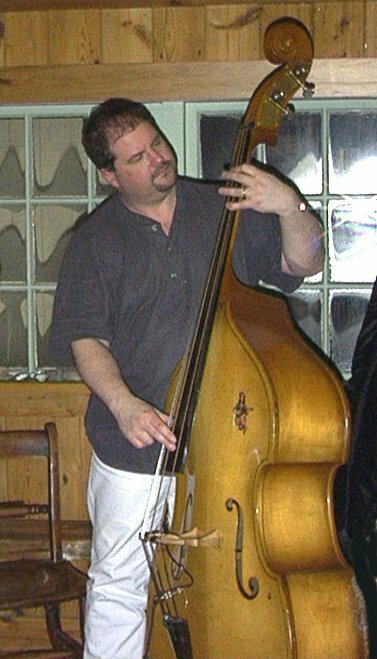 Marc plays Bass and, although shown in the main band picture playing a lovely Gretch electric bass, Marc has since mastered the upright doghouse bass and moved across to fully traditional bass playing. Marc is shown here without his trademark "shades" during a band practice in January this year. Marc is also a superb lead guitar player, a fine mandolin player and is a director of growing national chain of music shops "Music Village" (mention my name and he will see you right!). Marc also plays a large part in arrangeing the vocals of which the band is justifiably proud. Marc has also helped us get to grips with the single mic performance technology. Greg plays Fiddle and is a fine Bluegrass fiddler with a wide range of styles all of which he excels in. Greg plays a fiddle made for him by Mike Nelson modeled on an instrument made by Maggini. 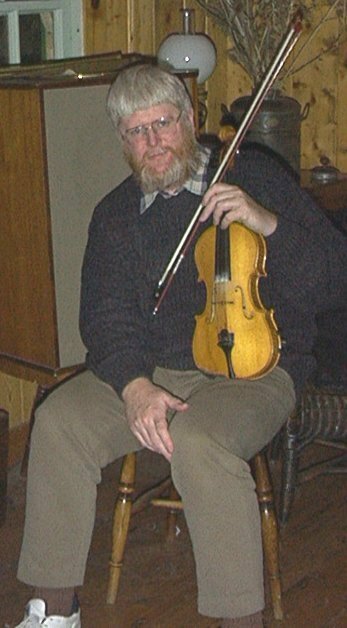 Greg and his wife Hazel (who plays Hammered dulcimore and fiddle) teach classical violin and Shetland fiddling in their spare time.